being admitted to a psychiatric facility is objectively a circumstance of last resorts and brackish teardrop stains and i’ll-be-back-soons. it’s a snowy everest of personal inquiries and skin assessments and medications and medical staff dictating when you can and can’t have your toothbrush. it’s homesickness and weeping over the phone to your mother because you want to see what it’s like to be you again; you want to wear that skin again. the flesh of somebody who knew how it felt to be eye-catchingly alive, like a girl in the middle of summertime in the bed of a pickup truck stargazing at the big dipper alone because alone is okay when you have something to guide you. only alone isn’t okay when you feel like this: deflated like a hot air balloon stumbling through a vermillion-sunset sky. it’s desolate and dilapidated like an apocalypse where the zombies eat your heart out, and it lays heavy on your chest like a boulder crushing the wildflowers beneath it. and even yet, the baby’s breath will corkscrew up the sides toward the sunlight. inside, there are people who you will know. you will understand each other through vulnerable conversations before lights out and group therapy sessions and quiet embraces when the nurses aren’t looking. you will laugh real laughs that bubble up your throat like sweet champagne on new year’s eve that you haven’t tasted in months and you will encourage others in this. it is a hospital kind of joy, a pastor called it. the sapphire at the bottom of a soundless cave. it’s the i’m-here-if-you-need-anythings when bottom lips quiver and legs shake in spite of the overwhelming consumption of your own bad thoughts. the discharges take you in their hands and crush you like lemon slices until the acidity burns. you will support each other on the outside, but it will not be the same. they were there when you needed them. they were all color and lion-heartedness and gentle touches. they tell you what it’s like to feel whole again when parts of you are desiccating. 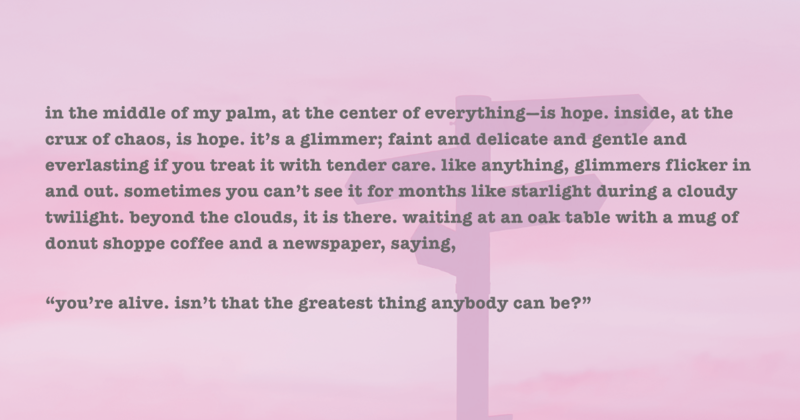 and in the middle of my palm, at the center of everything—is hope. inside, at the crux of chaos, is hope. it’s a glimmer; faint and delicate and gentle and everlasting if you treat it with tender care. like anything, glimmers flicker in and out. sometimes you can’t see it for months like starlight during a cloudy twilight. beyond the clouds, it is there. waiting at an oak table with a mug of donut shoppe coffee and a newspaper, saying, “you’re alive. isn’t that the greatest thing anybody can be?” and so you bandage yourself and pack your bags and leave to find home again. to find the gatsby-green light within yourself that they unearthed in you. nothing will be crystal clear; most things will be hazy like a daydream you can’t shake yourself out of. but the daydream is earth-shattering and utterly brilliant; it’s a glint of what you can be. hold onto that like the reigns of a wild stallion. it will buck and pull and kick, but it will carry you to where you need to go. it will carry you how atlas bolstered the world on his shoulders. you will feel that weight—only there will be moments where you will be unfettered, and this is when your lungs will ache and your bare feet, scarred and bruised, will lead you to where you need to be. your destination is no utopia; you will endure anguish like rose quartz erodes with the weather, but it will be followed by a scintillating stone—breathtaking and meaningful. life will become bearable, and waking up will not be waterlogged by a dreadful lagoon of rubbing the sleep from your eyes until you can no longer see. you will look at the day as what it could be instead of what it is. your ribcage will flutter with the new life of butterfly wings, and you will remember the moments that mattered. the faces that impacted you with their kind eyes and thoughtful words—and perhaps most importantly, yourself and your growth, like a redwood tree at the kernel of a forest. do not lose this, yourself; and if it so happens that you do, follow the road back home. Thank you for writing this. I’ve been in hospital too many times to count, and the hospital is an experience that is so difficult to explain to people, to explain to myself even expect there’s comfort in knowing that someone else is helping me be safe, it’s not entirely on my shoulders. And there’s comfort in knowing that at that time, it’s the right place for me and there are others who can understand the desperation in my life. It’s a comfort to know that I’m not alone in those dark times. You are a wonderful writer and have helped me feel less alone, thank you for writing this.